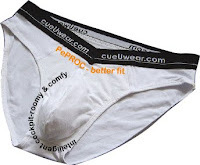 Cue Underwear – Innovation for Run of the Mill? rather average. The fabric is made from 92% cotton/8% lycra. In style, Cue also falls a bit short. they needed too much fabric to make the seam. handling charge, they'll send you a pair for free.